What can I do to prevent spinal arthritis and other serious spinal problems? Perhaps the most important thing you can do to prevent spinal arthritis and its devastating effects is to have a Chiropractic spinal check-up on a consistent basis. It is never too early ~ or too late ~ to have your spine checked. Researchers are finding the earliest signs of spinal decay in young children, which tells me that your children should be checked right now (especially if they carry heavy backpacks during the school day. For adults who know they have spinal arthritis, a check-up can determine what can be done to stabilize the damaged areas and prevent further damage to other parts of your spine. I am committed to helping you enjoy fantastic health. What happens on my first visit to your chiropractic office? You will come in and meet one of our team members who will give you some forms to complete. They can help you with anything you need. Next you will meet me, your Chiropractor. We will sit down and discuss your specific health concerns and goals. We will even discuss your past health history. If you have an accurate list of all medications you currently use that would be most helpful. During this time I can answer some questions for you. After learning about your health history, we will do a thorough Chiropractic evaluation. The evaluation consists of postural evaluations, motion testing, spinal checks, Chiropractic and orthopedic tests. None of the evaluations are painful. Following the evaluation x-rays will be taken if indicated. At that point your first visit is complete You will meet with our team member again, receive some information to take home, pay any fees due and set an appointment to return for a discussion of your exam results and to see your x-rays. It is on this second visit when you will find out if and how Chiropractic care in my office can help you. The second visit is when you will have enough information to decide what you will do to improve your health. What do adjustments to my spine feel like? This is the question most people wonder about. It may be the most difficult to answer because it requires describing a feeling. For example, how would you describe what "love" feels like? Could you describe what a hug feels like? Sometimes it is easier to experience something to understand it. An adjustment is like that, something you have to experience.OK that being said, your question remains, what does an adjustment feel like? In my office I use specific pushing or pulling pressures to move (adjust) stuck bones. After a quick push or pull many of our practice members describe a feeling of relaxation and well being. Some feel energized. Most people tell me that it is a pleasant experience. My goal is to make every adjustment as easy and as comfortable as possible. 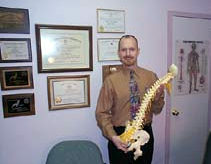 In my office I have helped hundreds of people who were terrified of being adjusted. Almost all had never been adjusted before (we tend to be most afraid of what we do not know). What those members found was that the adjustments were pleasant, easy and relaxing. Just the other day I gave a woman her first adjustment, she was terrified of what it would be like, but she trusted me enough to help her. After the adjustment she said "That was it!?" "I was scared of that?" "That felt great!" Needless to say I am going to love working with her and she is going to enjoy her improved health. wahnerchiro@verizon.net © 2015 Barry Wahner and Melinda Zipin Consulting. All rights reserved.